The exact beginning of the Chinese New Year Celebrations is not entirely known but it is thought to have started from the year end religious ceremony in Shang Dynasty (1766 BC - 1122 BC). Some believe it started as early as Emperor Yao and Shun (~2300 BC). Legend has it that the Chinese New Year started with the fight against a mythical sea beast called the "Nian". The "Nian" has the appearance of an Ox with a lions head. On the night of New Year's Eve, the "Nian" appears and tries to harm people, animals and properties. The "Nian" is said to be afraid of the colour red, fire and loud sounds. For protection from the beast the people posted red Dui Lian outside their houses, launched fireworks, hung lanterns and stayed up all night to fend of the "Nian". The lantern festival is held on the fifteenth day of the first lunar month. Some of the lanterns may be works of art, painted with birds, animals, flowers, zodiac signs, and scenes from legend and history. People hang glowing lanterns in temples, and carry lanterns to an evening parade under the light of the full moon. In many areas the highlight of the lantern festival is the dragon dance. The dragon—which might stretch a hundred feet long—is typically made of silk, paper, and bamboo. Traditionally the dragon is held aloft by young men who dance as they guide the colourful beast through the streets. The New Year's Eve dinner is the most important dinner for Chinese people and is eaten at home. This is usually a family reunion dinner, especially for those with family members away from home. The New Year's Eve dinner will normally consist of fish while dumplings are the most important dish in Northern China. On the stroke of midnight on New Year's Eve fireworks are launched to drive away any evil and to celebrate the coming of the New Year. Tradition says that the first person to launch a firework in the New Year will receive good luck. Long ago, people in China lit bamboo stalks, believing that the crackling flames would frighten evil spirits. Red envelopes are a long narrow envelope containing money and are usually unsigned. Traditional red envelopes are often decorated with gold Chinese characters like happiness and wealth. The amount is usually enough for the child to buy themselves their own gift like a T-shirt or DVD. The envelopes are given to children by their parents, grandparents, relatives, and even close neighbours and friends during Chinese New Year. It is believed that the envelopes will suppress the evil from the children, keep them healthy and give them long life. A few days before the Chinese New Year, people will do a complete cleaning of their house. This is to get rid of the old and welcome in the new. After the house has been cleaned it will be decorated with upside down fu, dui lian, and lanterns. Most of these decorations will be in red colour which symbolizes fire, which according to legend can drive away bad luck. The Chinese Zodiac uses 12 animal signs to predict people's fortune. The twelve animals are Rat, Cow, Tiger, Rabbit, Dragon, Snake, Horse, Sheep, Monkey, Chicken, Dog and Pig. The 12 Chinese zodiac signs are determined by people's birth year. Sweeping or taking out garbage during Chinese New Year is prohibited as you might accidentally sweep the good luck or good fortune out of the house. Celebrants avoid cursing or uttering inauspicious words such as "si" (die) and "shu" (lose). Auspicious words like "fa" (prosperity) are believed to bring good fortune. Avoid wearing black and white clothes to prevent looking like a funeral attendee. 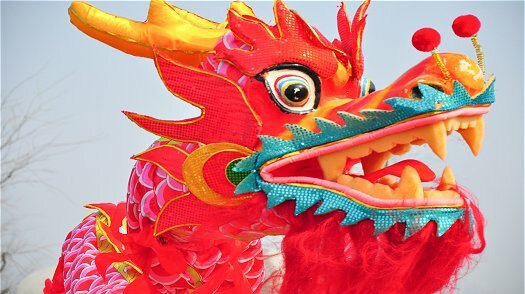 Debts should be paid off before the Chinese New Year period as Chinese believe that it is inauspicious to start a new year with an unpaid debt. 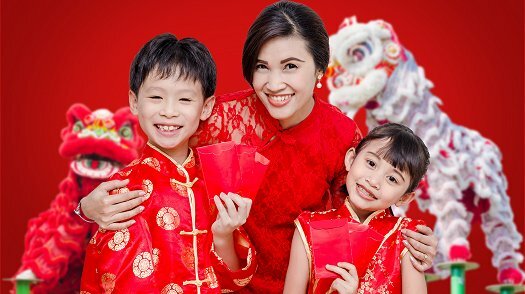 The use of scissors and knives during Chinese New Year period should also be avoided as it portends the premature end of relationships and depletion of wealth. Blood is considered as an ill omen and may bring about disasters.